Today I'm really pleased to introduce Christa Wiens of Fairytale Pumpkin. I'll get the disclaimer out of the way by saying that Christa is my very favorite daughter-in-law, and the incredibly adorable kids you will see in some of the photos at Fairytale Pumpkin are my grandchildren, Charlotte and Levi. Christa has just started a new blog and has opened an etsy shop offering digital scrapbooking. Christa, welcome. Can you tell us something about you and your family? You mean besides my wonderful in-laws? Well, I have been married to your son, Aaron, for 10 years this week (woo-hoo!). We met in the 7th grade, so we've known each other longer than we haven't known each other. We have three kids, two of whom your readers have probably already seen. Charlotte is 3 and Levi is 2, and they are the source of endless entertainment and photos. Our oldest son, Caleb, would have been 5 this spring, but he died of SIDS in 2005. Aaron is an optometrist, and after teaching elementary school for 6 years, I am now a stay-at-home mom. Fairytale Pumpkin is such a fun and interesting name. How did you choose it? This past October, my good friend had this super-cool, picture-perfect pumpkin sitting on her fireplace hearth. She told me where she got it, and so naturally I copied her by buying one and putting it in front of my fireplace. And then I made my kids take fall pictures with it. I was a little obsessed. When I found out it was called a fairytale pumpkin, I thought it was such a perfect name, and it just stuck with me. Digital scrapbooking sounds like the "modern" version of traditional scrapbooking. Can you briefly explain digital scrapbooking? You pretty much did. If you are familiar with traditional scrapbooking, digital is not really all that different. There is background paper, photos, journaling, and other design elements, like frames, titles and embellishments. The only difference is that it is all designed on a computer and the finished product prints in one layer, like a picture, with all the elements included. So I email my pictures to you. Then what happens? Along with your pictures, you can also tell me if you have any preferences, like background color or specific elements you've seen in another layout (you specifically asked for the clipboards for Andrea's layout), and you can email me any journaling you'd like to have included. I will then put all the pieces together and design a unique, one-of-a-kind layout for you. I will email you a low-resolution jpeg file to review and make changes. Once you approve, I will email you a high-resolution jpeg which you may print or have printed. Alternatively, I can print it for you and ship it. It can then be easily slipped into an album, put in a frame, or anything else you like. I don't have a printer capable of 12x12 printing. What are my printing options? The pages print very nicely in 8x8 as well, or you can have them printed for you in either 12x12 or 8x8. There are a number of online services that will do this, such as http://www.scrapbookingpictures.com/, http://www.scrappingsimply.com/, and others. Costco now prints 12x12 and 8x8 sizes, and that is where I have all mine done. The quality is great and they are the cheapest around, with no shipping costs. If you have a book designed, you can also upload it to a website like shutterfly and have it printed and bound. I'm a quilter. How would digital scrapbooking be of benefit to me? As the daugher-in-law of an avid (and extremely gifted) quilter, I can say that I would love to one day have a scrapbook of all the quilts my mom-in-law made, along with pictures and stories of the people she made them for. I have done some quilting myself, and I know how personal each quilt is. I think it would be so valuable to have a record of that. Our friend, Jessica, also comes to mind here. She just had an enormous quilt made for her, with a different friend making each block. To document this wonderful gift, she had each person take a photo of themselves making the block and they included a note to her. She put these into a scrapbook so each personal story would be remembered. There is also a new, or maybe renewed, move toward documenting the process of quilting. That is so true, Christa. Here's the thing. I used to be an avid scrapbooker. 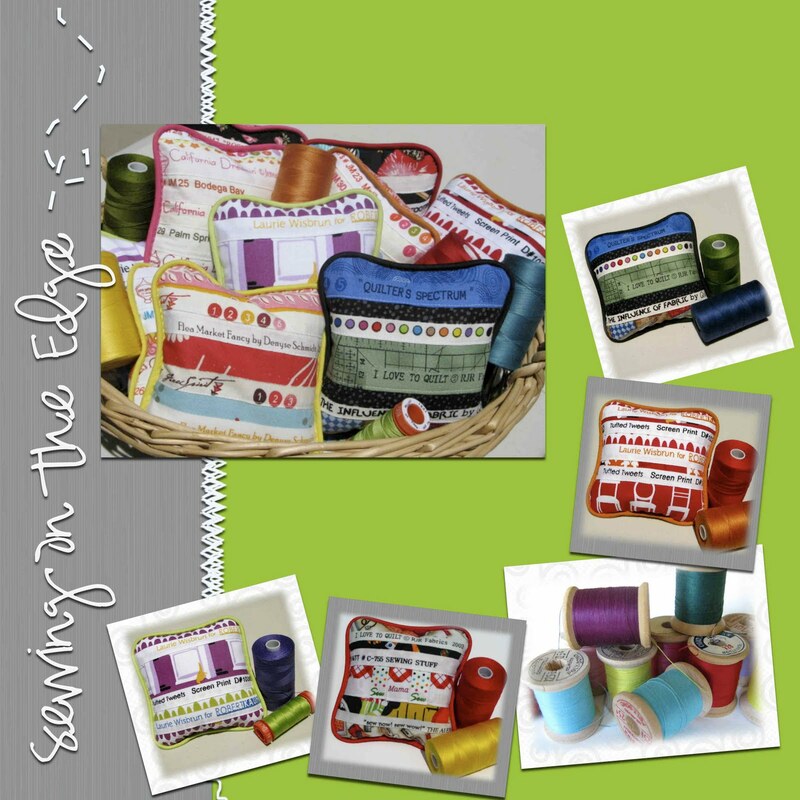 There are so many similarities between scrapbooking and quilting. Gorgeous paper, both solid and prints, scissors, embellishments. But once I started quilting, it became my obsession. Fabric takes up space. Scrapbooking supplies take up space. And I simply didn't have enough space for both of them. I think Christa makes a good point that there is much interest in documenting the actual process of making a quilt, from the initial design process to putting that last stitch in the binding. Kate Conklin and Andrea Harris shared their pictures and stories with Christa so she could make layouts of the process they went through, from their initial sketches, or in Andrea's case, her son Ethan's sketch, to the finished quilt. 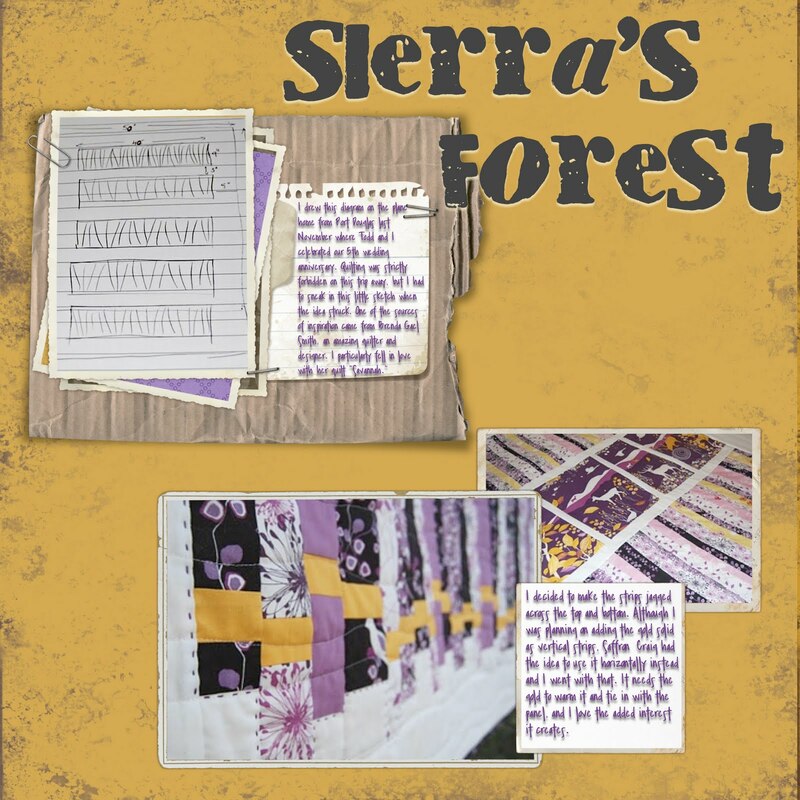 Kate recently designed "Sierra's Forest" (which incidentally is available as a downloadble pattern on her website) using Saffron Craig's newest fabric line, Forest Elementals. It's so interesting to see how Kate designed this quilt from beginning to end. Andrea's story is one that made her heart melt, as it did mine when I read it on her blog. Her son, Ethan, designed a quilt using her colored pencils. She then turned the design into an actual quilt, and eventually it became a pattern available on Moda Bake Shop. Are there other things you will be adding to your shop in the future? I currently have weekly calendars available in my etsy shop. These are custom-designed weekly calendars with interchangeable pictures. I created these out of my own need for a way to help my toddler anticipate her week, and, truthfully, to not have to answer the question, "Mommy, what are we doing tomorrow?" 100 times a day. I am also planning to create a daily calendar with a similar design. As a teacher, I think these would be really valuable for kids with special needs. I have done some invitation designs as well, and will likely be adding some of those to my shop. And I am open to suggestions! If someone wants something they don't see, I am more than happy to see whether or not I can design it. I had Christa design a layout with some of my selvage pincushions that have recently been in giveaways. She was able to incorporate my new etsy logo colors and stitching. Here's what I'm thinking. A giveaway would be a great way to introduce both digital scrapbooking to quilters and definitely take advantage of the talent behind Fairytale Pumpkin. What are we giving away? 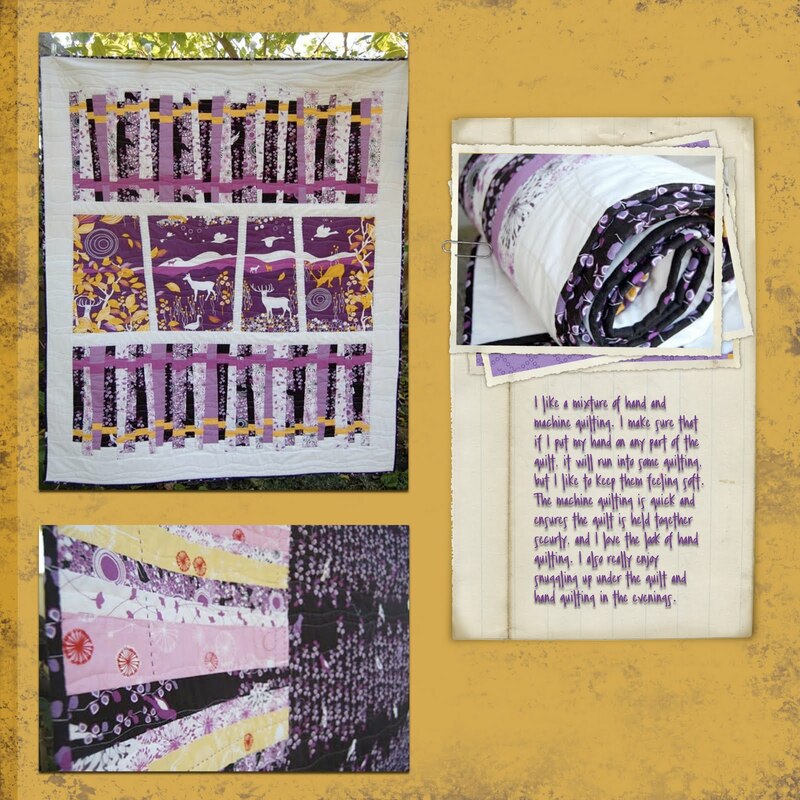 A two-page layout that will showcase your quilts, or anything else you desire. You email your pictures to Christa and she'll create something really special for you. 3. Check out the layouts on Fairytale Pumpkin, come back and let me know what your favorite layout is (it would be great if you leave a comment on her blog as well--it won't count as an entry but I'm sure she would love to have you say hi.). 4. Follow Fairytale Pumpkin on Facebook. 5. Follow Fairytale Pumpkin on Twitter. 6. Blog about this giveaway on your blog...and come back and let me know. That's six (6!!) easy chances to win a two-page digital layout. You have until 10 pm pdt on Saturday the 12th to enter. So let the commenting begin! Wow Christa! 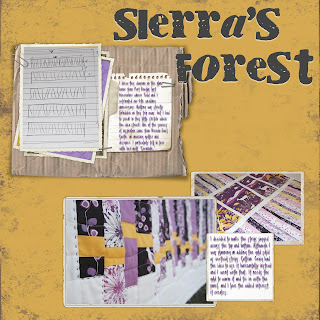 Thanks so much for creating these beautiful scrapbook pages for me of Sierra's Forest. I love it how you've combined the text, diagrams and photographs to document the whole process from start to finish. Fantastic work! 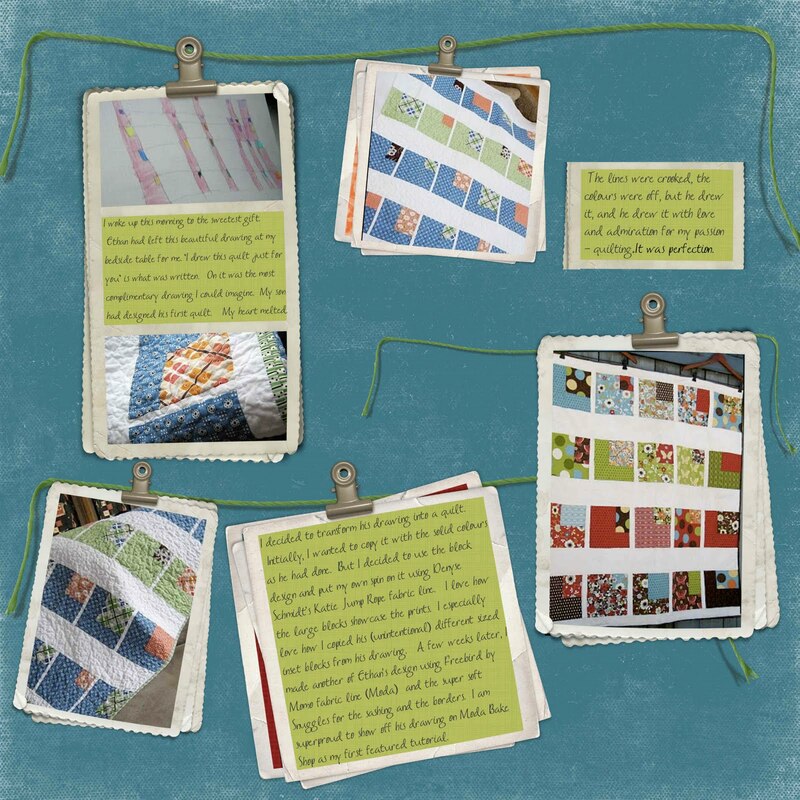 I have made my own digital scrap book before and I am a quilter. I admit that I never thought of putting the two together. What a great idea! I just checked out the Fairytalepumpkin etsy page. I love the disign with the clips that look like the pictures are hanging on a line. My favorite one is the Days of December. I think it would look great as an advent page like a count down until christmas with pictures of family and other things that we are thankful for. Great Job! What a great idea! I'm not much of a scrapbooker but this is something that I would love and could actually keep up with! Kate, thank you so much for allowing me to scrap your work. What a privilege! Fairytale Pumpkin IS a really wonderful name! Lovely layouts. I follow the Fairtytale Pumpkin blog. That's awesome that she has such a great mother in law. I'll follow her blog - it's good that she's doing something that she loves. What a fabulous idea to combine the process of quilting projects with scrapbooking! I think it's a fabulous and important thing to document.... You did a super job Christa, thanks so much for putting together a page for my Ethan quilt. Journalling and combining the photos really makes it memorable. I have a freind who loves to digital scrapbook who is going to teach me. This would be such a great way to start. I think this is such a neat idea. Good luck, Christa! Wow what wonderful pages. Your work is great. Also, just wanted to comment that I really like the Holiday Baking layout best (although I am biased to the "Get Wet" layout too...). I love layouts that use the most of the page, putting photos to the edges of the page, clean and crisp! I love all the Fairytale Pumpkin layouts! I started as a paper scrapbooker, than digital scrapbooker and now a quilter :) I love her ideas and she does a great job! Thanks for sharing!